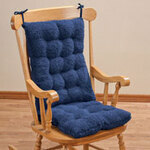 Plush, tufted booster cushion adds comfort and support to any hard chair. Soft, luxurious polyester suede makes any chair a pleasure to sit on while giving it a fresh new look. Built-in handle for easy transport. 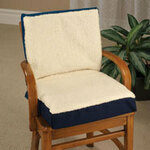 Seat cushion measures 14 1/2” L x 14 1/2” W x 4” H. Spot clean. This stylish addition to our cozy cushion provides extra protection and peace of mind. Quilted and waterproof, it discreetly prevents moisture damage. Polycotton; vinyl. Washable. 14"sq. 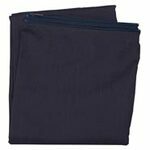 Zippered cover for foam seat is offered in classic navy. 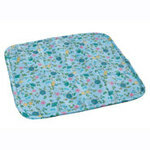 Machine washable cover available is 50% cotton, 50% polyester. Fits 18" x 18" x 4" foam comfort cushion. 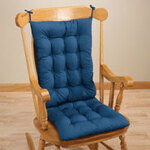 Rocker chair pad set cushions your wooden rocking chair’s seat and back for cozy comfort. 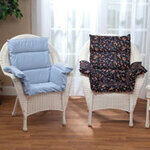 Two ties secure 17" x 19" x 3" seat pad; four ties secure 17" x 22" x 3" back pad. 65% polyester/35% cotton cover with 100% polyester fill is spot clean. Imported. 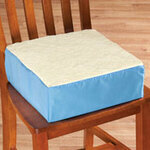 High-density gel seat cushion has a gel center for added comfort when sitting for long periods of time. Cotton/poly cover with cozy faux-sheepskin top removes for machine-washing. 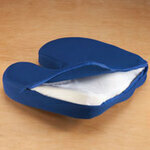 16"L x 18"W x 3 1/2"H.
Contoured memory foam coccyx cushion relieves pressure with center cut outs. 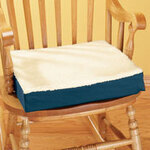 Wedge design of memory foam pillow encourages good posture and fits comfortably on any seat. Removable mesh cover is breathable and machine washable. 17" L x 14" W x 2 1/2" H with 3" U-shaped opening. Spot clean. 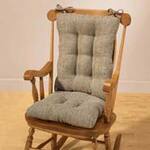 Sherpa rocking chair cushion set by OakRidge™ adds cozy cushioning to any chair. Chair pads secure with 4 ties on the back and 2 on the bottom. 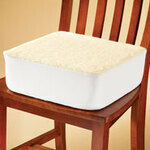 Back cushion measures 22 1/2"L x 17"W x 3"H; seat cushion is 18 1/2"L x 17"W x 3"H. Spot clean only.